To improve communication with residents and pet owners, Dallas' Animal Services Department has formed a partnership with neighborhood social network Nextdoor. The shelter joins the Dallas Police Department, which has been partnered with Nextdoor since November 2012. 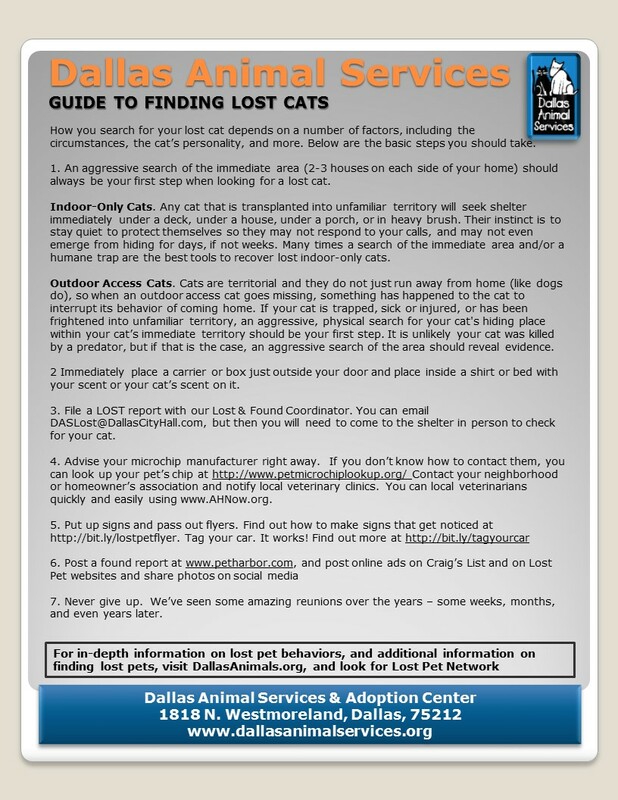 Dallas Animal Services will use Nextdoor to share safety reminders, information on animal resources and updates on adoption events. This is the first alliance of its kind in the nation for Nextdoor. "They're our first animal services partnership, and they're leading the way for the United States," says Robbie Turner, senior city strategist at Nextdoor. 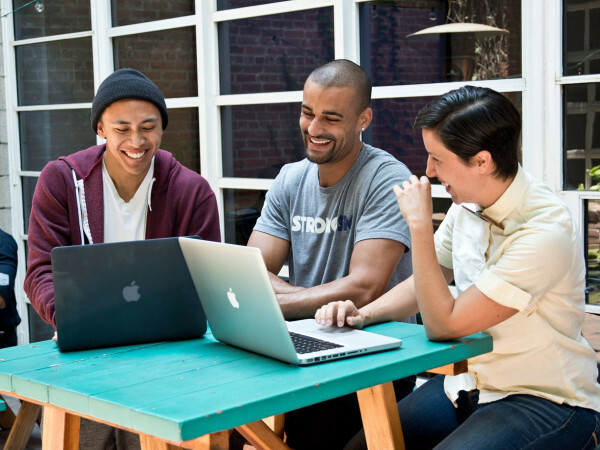 Founded in 2011, Nextdoor is a San Francisco-based social network that focuses on neighborhood issues. Dallas is one of its top 10 cities in terms of presence, with participation in 6 percent of Dallas' approximately 601,000 households. Each Dallas neighborhood has its own Nextdoor website, accessible only to residents of that area. 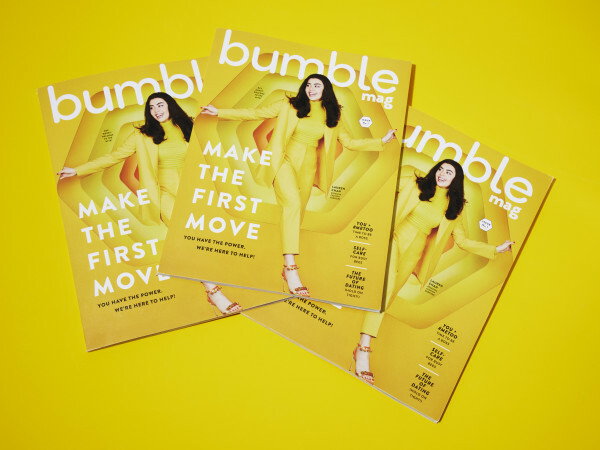 It hasn't yet drawn the following of social media giant Facebook, but it's proven useful in for-sale ads, advice on vendors, crime watch and pet notices, which are more relevant than Facebook because of Nextdoor's target on neighborhoods. If you see a dog on your street and post it to Facebook, that's often a too-wide swath of people who don't live nearby. "That's true across the country, that lost and found pets have been one of the most popular uses," Turner says. "That's why we love the fact that DAS is using Nextdoor, because it fits right in with what our members are already talking about." Meanwhile, a new website has been created that shares crucial advice for people who've lost or found a pet. 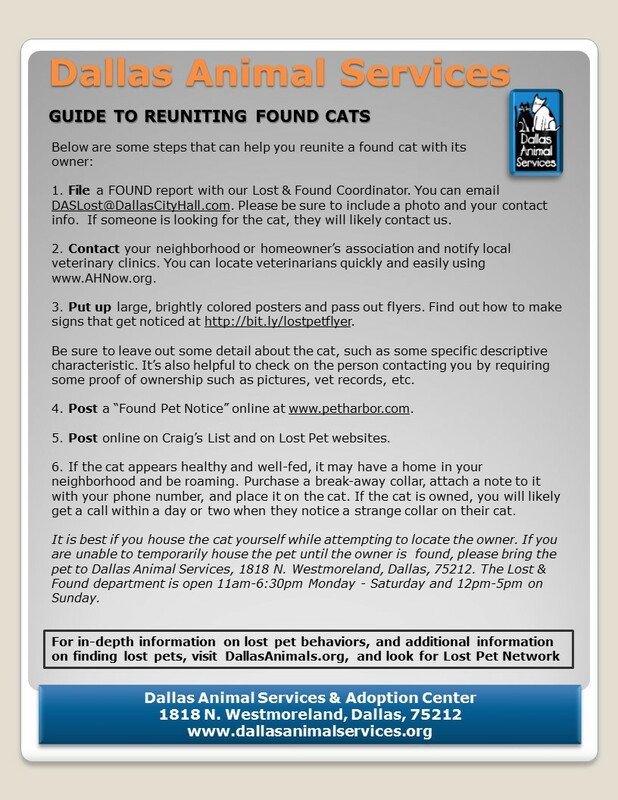 Called Lost Pets Dallas, it offers guides for four groups: those who've lost a dog, found a dog, lost a cat or found a cat. Some pets respond to the age-old technique of standing outside and calling your their name, but others, particularly cats, require specific techniques, says Rebecca Poling, a spokesperson from Dallas Companion Animal Project, the nonprofit group that created the site. "There are a couple of organizations that try to do lost pets nationwide, but it doesn't really work," she says. "The most successful lost-pet efforts are at the community level." 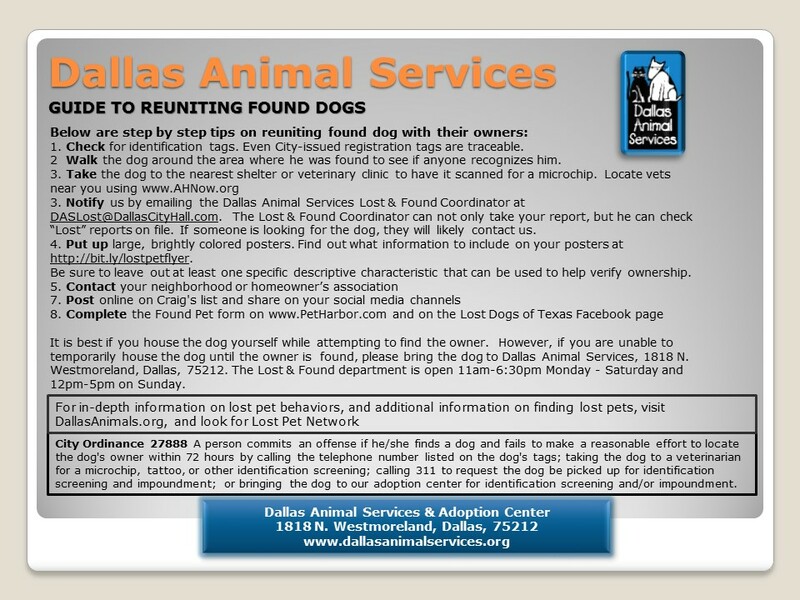 She calls Lost Pets Dallas a one-stop for anyone who has lost or found an animal. "If you've lost your pet, you want to go to the shelter every day and see if it turns up, but it's not all you do," she says. "You have to let the neighbors know, you have to put up signs that get the attention of passersby." She credits Nextdoor with doing a better job of reuniting pets than "almost anything that's happened" lately. "A lot of what we're offering on this website is for people on Nextdoor who are trying to reunite pets and people who are trying to find their cats," she says. 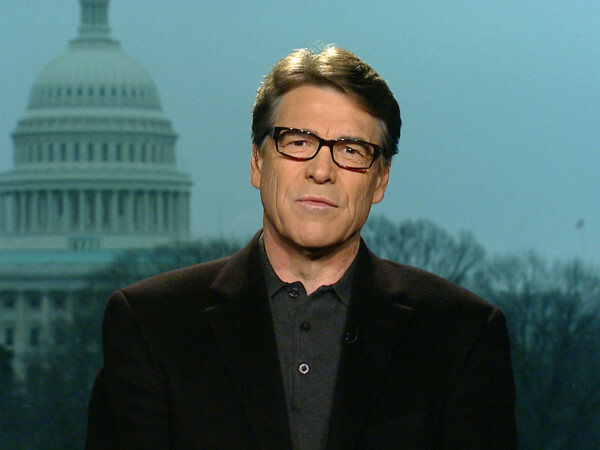 "The return rate on cats is really low, less than 50 percent. If you're trying to find a cat, you have to work through a process. You start with a trap, you look close by; people are usually looking in the wrong places." The shelter still advises those with animal issues to call 311 or 214-670-3111, or 911 in an emergency, and to visit Dallascityhall.com. 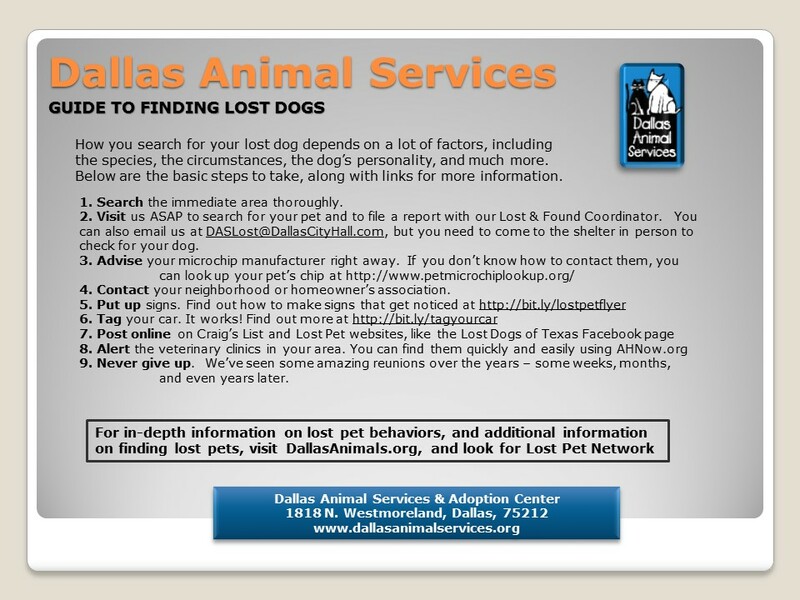 DAS also has a lost-and-found coordinator at 214-670-9501 or DASlost@dallascityhall.com.